Yesterday, while wandering through Michael's (as I'm often wont to do, though the ratio of visits to actual times I purchase something is something like 3:1), I passed an isle and saw some packages at eye-level. Shrinky Dinks Inkjet... Yes, I recognized that, people have mentioned the stuff on DeviantArt, among other places. I squinted at the price, almost 14 dollars was a bit steep, but I had some money left over... urgh, fine. Quite a while ago I had wanted to try the stuff, time to buckle down and get it. Of course I had to try it out with my Crystal Ball characters! 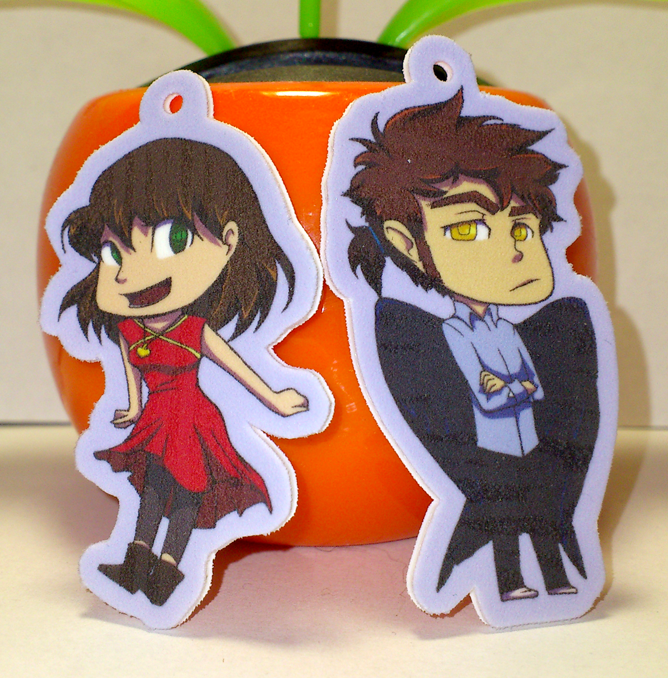 The charms came out pretty well, even for a first run. Our (currently) unnamed magician came out a bit dark, since his pants and Wings are a dark navy color, the charms are a bit too big (these measure a bit over an inch tall--because of this I could only fit four in total on the sheet), and they aren't completely flat (didn't read the instructions completely through and didn't immediately flatten them out), but despite these over-critical complaints, I really like how they came out! My biggest, truest complaint would be the price. I paid fifteen dollars and change for six sheets. Next round I'll probably be able to squeeze 5-6 charms, since they'll be smaller, but still. Amazon has them for like ten... but with shipping it ends up the same.